We're Christmas ready, here at Bondi. Well, almost -- there are still some lights to string up, if we can tunnel through the snowdrifts Brian has been plowing up -- but we're good to go! We're looking forward to welcoming our guests. Right now, we've got very limited vacancies from December 27th through New Years. One two bedroom cottage is still available for the New Year's weekend, with a minimum of a 3 night booking. We've got some space still over Christmas itself, however. We've got one family coming from New Zealand, to see a Canadian Christmas! What fun! We're providing a Christmas tree for them, and we've spoken to the deer to ask them to be sure to come and pose on the lawn! If you listen to the weatherfolk in the media, most of whom look like they have never been outdoors in their lives, you would begin to think that a sprinkle of snow is a complete disaster. Nancy remembers a trip to England one Christmas, when one inch of snow shut down British Rail -- and she got into a heated argument with a London cabbie about driving in snow. But that's across the Pond. Over here, snow is a fact of life, which arrives every year about this time, and we are getting a little tired of the media moaning about how bad it is to be out of doors. Besides, there is a huge variance in the weather reports -- it can be heaving it down in Toronto, and be sunny and dry up here. 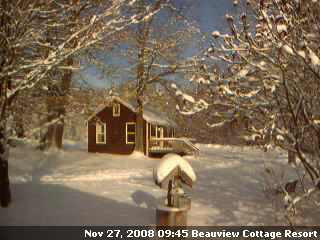 It can be snowing in Gravenhurst, and sunny up here. It can be raining in Huntsville, and the roads are dry at Bondi. And vice versa. Sure, there's a snowbelt near Barrie, but the roads farther north are often untouched... You get the picture. Or do you? We want you to get the picture!!! Our good friend and near neighbour, Gord Bell, over at Beauview Cottage Resort, is no slouch in the internet department, and he decided what was needed was a way to reveal the Truth and make sure you GET THE PICTURE! and see what's really happening. Bondi doesn't have a webcam operating just yet -- heck, we're still finalizing the high-speed connection "thing", but Gord's close enough to us to give you a great notion. 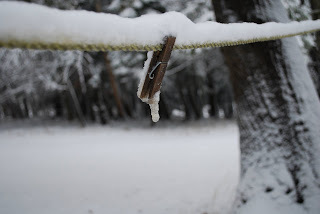 And you can keep checking out this Blog -- we've got tons of current winter photos being posted almost every day! If you heard a soft WHUMP recently, it was the sound of Winter arriving in Ontario. Or, as Brian called it, Insta-Winter... He should know, he's the one who's being doing the bulk of the shoveling, plowing and general rearranging of the snow. The horses love it. And, as an added bonus, come in clean after rolling and playing outdoors. The deer trail their footprints across the snow like strands of pearls. The Bobs are collectively revelling in their new, toasty-warm indoor quarters. the birds are back at the birdfeeders. We've all had to dig out our sunglasses. And Carol is thrilled that a new FabricLand has opened in Huntsville. She is our major domo in charge of decorating, and spends a lot of time with a sewing machine creating curtains, pillow shams, etc. for teh cottages. She's the one who suggested we use this photo -- taken by Brian (who takes much better pictures than I do), to epitomize the spirit of winter. Hang in There! It might be cold, and snowy, but it is truly beautiful, and there's still so very much you can do! And weather, it is reported, is still the number one topic of conversation amongst Canadians -- so where would we be without it??? 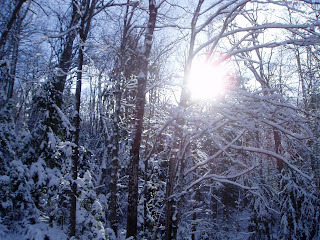 When sun shines on fresh snow, the effect is breathtakingly lovely. Brian got the full effect of this. 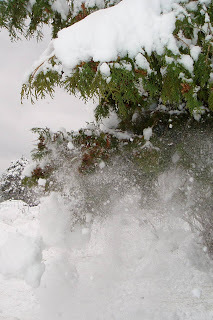 While he had the ski trails in great shape in October, the heavy fall of snow brought down branches and required clean up, so he has been spending a lot of time in the bush. 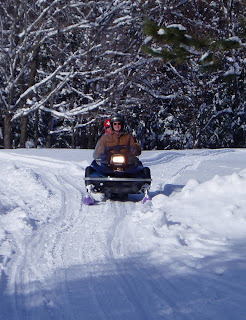 The trails should be ready for our guests who are coming up for Christmas. We have a wonderful variety of ski trails, from gently rolling open fields, through our private spruce bog (where a moose was bedded down last week!) 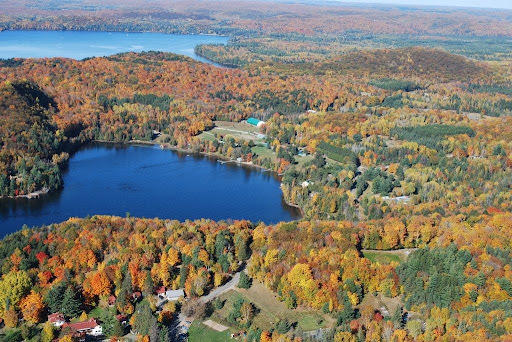 up onto the hardwood hills that offer a bigger challenge. For winter watchers, we now can report that the bay is beginning to freeze. We follow this progress --in fact we have records of Ice In and Ice Out for our bay that stretch back for almost a century now! 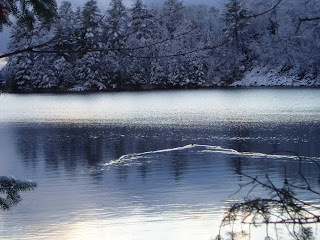 Ice in means our last loons will be heading south. The Canada geese have left the lake. But there are those birds that stay year round. Snow means the chickadees and bluejays are coming back to the feeders, along with the woodpeckers and nuthatches. It's easy to figure out from the tracks in the snow who your neighbours are. And the sun in the trees, all sparkling, well, that just plain makes you feel good. And makes you reach for your camera, too. Let's face it. Winter is more fun when you can play with the season. 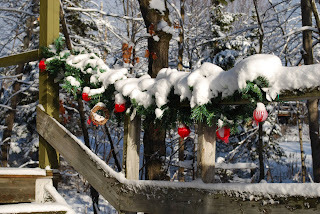 Our snow has arrived up here in North Muskoka. Our roads are clear, and we're ready for the season! The ice is starting to form on our bay. Brian is out working on the ski trails. We've got almost 20k of trails at Bondi Village, along with toboggan hills, snowshoe trails and rentals, a tubing run, and lots of wildlife to watch. 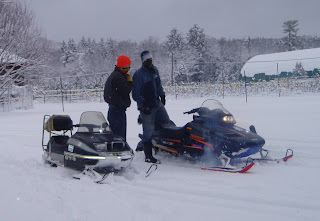 Some of that wildlife might include David and his buddy Mike, who were delighted to have the chance to get the snowmobiles out of storage and ready to go. 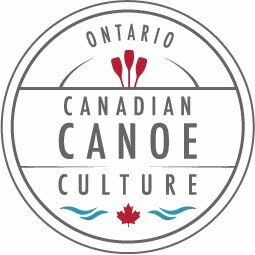 Obviously in November the Snowmobile Clubs (ours is the Algonquin Snowmobile Club) don't have their trails open, and since there's no ice it's a really excellent plan not to try any water crossings, but the season is approaching fast. Over at Hidden Valley Ski Centre, the snowguns are running, and the hill groomer is having just too much fun creating the moguls and funky stuff for the snowboarders. 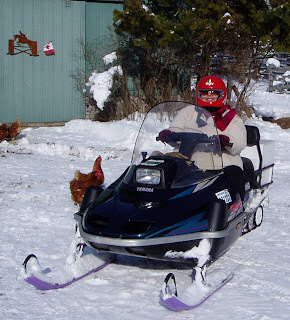 For those seeking less adrenaline, like Nancy, taking a slow ramble in the woods or the back fields to check out the animal tracks and listen to the snow crunch underfoot is a great excuse to get outdoors. Winter's here. 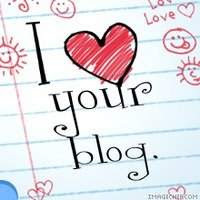 You should be too! all set to provide you with family winter memories that will last for generations! 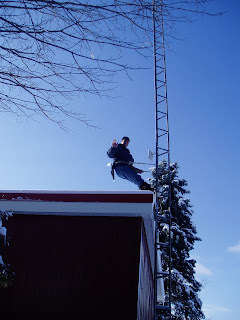 That's Fred, from Avery Audio, up the tower working his magic to get the office connected. The tower was put up by Brian, Dave and Mike (with a little help from Carol and Nancy) last weekend. Jim, from Brendish Computers, tramped about in the snow figuring out what else we'd need to get the signal not just to Brian, not just to Nancy, but to the entire resort. The adult loons head south long before this, as a general rule, but the juveniles stick around until late November. This chap was fishing in front of Clover cottage this evening, in the wonderful evening light, drawing an almost perfect "V" across the mirrored water. It's been said that during summer there are so many shades of green you cannot begin to count them. This time of year, it's the blue shades that come into their own. All the chickens, you may recall, are named Bob. 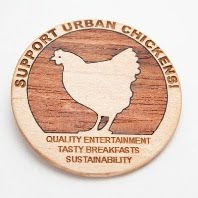 They have 'subcategory names,' (Kung Fu Bob, Bob Alfredo...) And through the summer, we had 24 hens. This autumn, the numbers decreased. Starting with the chicken that threw herself under the wheels of the golf cart. That was a bad scene. Loud lamentation, and a 21 gun salute at the funeral followed. Then, during the last week of hunt season, one of the hunting dogs that seem to run wild in the bush at this time of year grabbed a chicken in the yard, shook it, and ran on. The bird died of shock. The only up-side was that the dog's owner was talking to us at the time... and was suitably upset. So, for the past week, it's been 21 chickens. With winter coming on, they are moving into their new winter roost -- chickens aren't fans of the snow. Last night, Nancy carefully relocated all 21 birds into the new, warmer roost, and shut the door. She finished feeding the horses, and was sweeping up the aisle, when she turned around and found a chicken in the middle of the aisle. "How did you get out?" she asked, scooping up the bird, and taking her to the new roost. Where 21 chickens sat looking back at them. So, we are back up to 22 birds. One has been simply missing for almost two weeks. Chickens don't run feral in the wilderness... so the question is where has this bird been? Back in the summer we thought we'd lost one, when Octave tried it on for size in stock pot... but that was another story. Napster's vote was for the guest who suggested he should have a celebratory tee shirt that read "I BEAT ANOREXIA"
He's less than enthusiastic. Not like Achmed, the participatory cat. On Friday, Mike W. was waiting at the nearby Firehall for his dad, Dave W.. Dave W. was staying at Bondi. This was their last day in the bush for the hunt season, and it was an early start. When Dave drove into the rendezvous, Mike waved him to keep driving. "Don't stop," he called through the opened window, "just drive back to the resort. Slowly. Achmed's on the roof..."
Snow! Not just a sprinkle on the ground, like we had in October, but real honest-to-goodness snow! 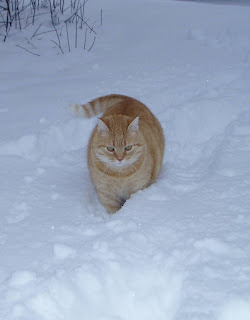 It fell during the night, and we woke up to find a clean, crisp world of white. Now, some folk, when they are greeted by that, groan. They see the glass as half empty. They lament the end of the days of lying motionless on a beach towel. They have failed, utterly, to grasp the situation. 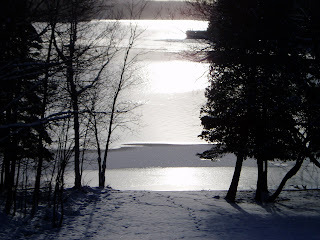 Winter is not a spectator sport -- you have to get active to enjoy the beauty of this season! Downhill Skiers and boarders get the adrenaline, snowwmobilers get the speed factor, snowshoers and cross country skiers get the silent communion with nature... There are endless possibilities for building snowmen, snowforts, getting out the camera and catching images you can't find any other time. And it gives you a whole new apreciation for that fire in the fireplace when you come back indoors for tea or hot chocolate! Sure, you have to shovel... in California you have to rebuild from the ashes. In Florida, the hurricanes can carry you away... There's always a downside if you insist on finding it. Dave and Mike are both skiers. For them, snow is a wondrous gift. Everyone went a little silly out there... the way kids do on with first snow, when everything was suddenly transformed and new and beautiful. Brian challenged the boys to a rousing old-fashioned game of Fox and Goose (you stamp out a pie shape in the snow, and you play tag, but you must stay along the stamped out lines. No cheating) This went on until David wiped out, and Brian stopped to consider the repayment of his oxygen debt. Part of the autumn clean up involves trimming branches, and cutting firewood for the winter. All of which involves the building of BIG bonfire, that then waits for just the right conditions to be burned. 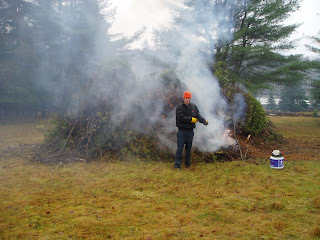 The stars aligned this weekend, and when Mike was here to help out on Saturday, he, Brian and Dave, with the help of a little accelerant, got the whole shebang burning. At first, since the wood and leaves are damp, it burns with a LOT of smoke... Mike called it a bon-smoke, not a bon-fire, but as things heat up, it burns faster, and cleaner! All that was lacking were some hotdogs, and a marshmallow on a stick. "I made this pie today, just before supper. It is the first pie I have made in over 20 years. I had a little help from Carol (wife 1.1) and I used her cookbook too but I did it all myself!!! The decorations are entirely my artistic addition, not even mentioned in the cookbook. We grew the apples on our tree, purchased the pie crust from A&P and the rest of the ingredients are standard things like sugar and flour and some secret spices that the OPP will not let me tell you about. Two of the Bondi Babes, Jen and Sandy, win this year's award for being the last people in the lake. they were here the first weekend in NOVEMBER! and while most of the Babes opted for a hike up the mountain, two of them took a quick dip. So, in the interest of promoting the principles of the books Wild Swim, and Wild Swimming (see October Blog "Seals in the Harbour. "), here's to you, girls! And may all the benefits of chilly dipping be yours! 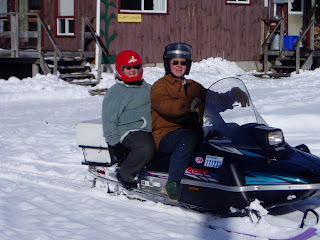 Dave and Mike enjoyed their 15 minutes of fame, getting their picture in the local Forester newspaper. The occasion was the last day that the Paintball range was open this year. And the occasion at the Paintball range was a fundraiser for the local Hospice. It's hunting season again. We permit a very limited number of hunters on our property -- friends and relatives -- but we are adjacent to a hunt camp, and you do hear the sound of guns these days. Why would we let anyone shoot a deer on our land? Well, here's the thing. 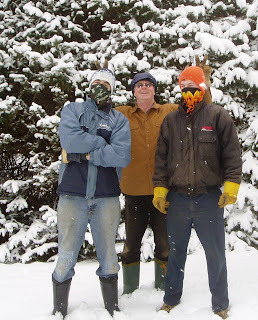 We have been partipants in the provincial Forest Management program forever. Over the years, the directives have changed with this program -- once upon a time, they wanted the slash or tops cleared up, for instance. Now they are directing that slash and tangles be left in the bush. They are recommending something called Exclosures, which are in fact small fenced off ares within the bush, all designed to give the young trees a better chance to get up above the browse line. In short, there are too many deer in this region to sustain themselves, and they are causing damage in the forest. This is in part due to artificial feeding programs that indiscriminately feed large herds of deer through the winter, boosting their numbers. These are often poorly thought through -- providing high protein feed to deer in winter, boosts their metabolism until they require far more feed than a deer surviving on tree buds and cedar browse would require. Every spring, we find deer that have gone down to starvation. Personally, we'd prefer a wolf pack. Or a bullet. 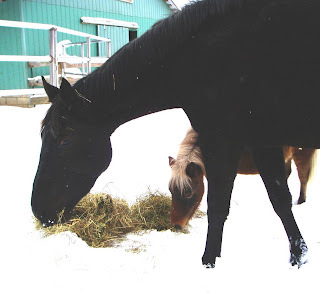 We have deer that bed down every winter in the horses' hay -- but this is timothy hay, not high protein alfalfa, and the only harm done is to Nancy's pocketbook. While we don't hunt ourselves, we have no issue with careful, legal hunting with the intent to use all of what you shoot. It's poachers we abhore, and we prosecute them to the full extent. Having lawful hunters on our property helps to discourage poachers, too, so that's a good thing. And it is not as easy as it sounds to 'go hunting.' The lads are out there today, in sleet. They can easily spend the whole day, and see deer, but never be in a position to 'get the shot.' It isn't uncommon for the hunters to come home empty. However, the boys are always getting new toys. This year, our cousin was the first to put a Stealth Camera in the bush, along the deer run where he has his stand. Now these cameras work like this: they can 'see' in the dark. They have an infrared beam... break the beam, and the camera takes a picture. Now the hunters are like the fishermen -- who could once spend all day happily fishing, coming home with an empty creel but a renewed and refreshed outlook on life, with blood pressure down, and dispositions sunny. 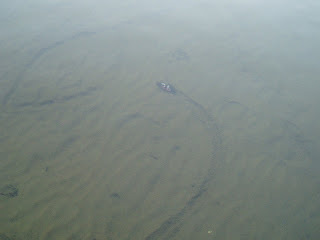 Then they got fish-finders. Now they can see the d*** fish down there... but can't get them to bite. They spend the day, still coming home empty handed, but with their fishing rods tied in bows and their blood pressure steadily climbing. Dang fish... There they are... right there... and they won't bite!!! Rick and Dave have a camera set up this week. It took this photo just after midnight. The Conservation Officer laughed at Nancy one year, when he dropped in to find 10 deer resting on the lawn. "I see," he said, "you've got it figured. The deer are on the lawn all day while the hunters are in the bush, and then, come evening, you switch them around." We all laughed at the time, but looking at the photos from these cameras, he has a very valid point. Now last week, we had some incredible weather -- spiking into the 20's. Some of our hunters confessed that they had a little nap out there in the bush, just enjoying being outside and alone in the fabulous weather. For most of them, that experience, being out, being in the forest, is far more important than the hunt itself. Fishermen, hunters... fishfinders and stealth cameras aside, never forget... it's about the journey. Not all Wildlife is as big as a Moose! Last November, when the Bondi Babes went on a nature hike, we found a garter snake in the back field. He was a friendly little guy, and spent some time with us before heading off about his business. Garter snakes are pretty little creatures. Even the genus name, Thamnophis -- means pretty snake. And no, snakes are NOT slimy, or cold, or nasty. Their presence is an indication of a balanced environment, and they will do you no harm whatsoever. This year, on top of the lookout, we were lucky enough to find a salamander, like this one Quinn photographed earlier in the year. If you roll over pretty much any old wet log in the bush, you'll find these little chaps. Today's visitor was delighted to find himself in a nice warm palm! There are 21 species of Salamander in Canada. The adults all have four legs, but some of the species that live in the damp woods lack lungs, and breathe through their skin. They cannot hear, but can sense vibration. The fact that this little chap was out today speaks to how mild the weather has been for the beginning of November. Salamanders can't survive freezing, and hibernate for the winter deep in the leaf litter of the forest floor. It's worth taking the time to check out our smaller neighbours on this planet. They're pretty amazing -- and while the big wildlife, such as deer, wolves and moose, get the glory, these smaller creatures are dazzling in their own right! 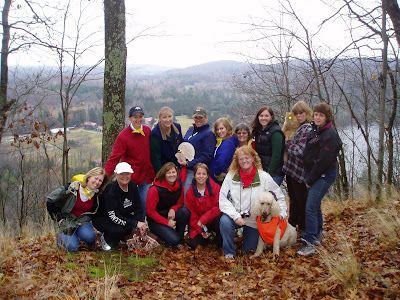 Each year, the Oakhurst gang of girls descends on us for a Girls' Getaway Weekend. This year, Ruth brought 19 gals along -- all in Princess tiaras -- and the fun began the moment they arrived. On a nature hike Saturday morning, they posed at the Lookout. Achmed the Cat, with his eyes like headlights, always comes hiking. And Holly, well dressed for Hunt Season, never misses a good walk. We checked out woodpecker holes, and bear claw marks, found mushrooms and artist's fungus, antler polishing trees - and hooted and hollered from the mountain top to those who'd stayed back at Bondi. Then it was back to the resort, to don feather boas, and tackle games of Scategories, Trivial Pursuit, and a wicked few hands of Euchre before the dinner extravaganza. As everyone NOW knows, Barak Obama is the new president-elect of the USA. Holly celebrated a milestone birthday Nov. 2. Our Wonder Poodle turned 16. She celebrated by going for a long hike in the back field, checking out the wolf sign and sniffing all the bushes. Her friend Tyko, the English Bull Mastiff came along. 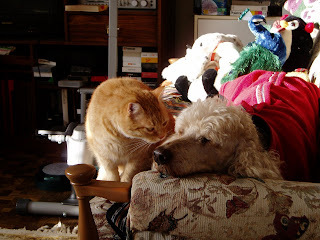 So did Achmed, the cat, who likes to hike almost as much as Holly does herself. 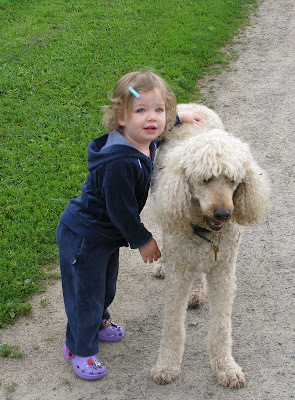 16 is a grand age for a standard poodle, and speaks well for her breeder, Michelle, from Torbec Kennels. Holly has been a great companion and friend right from the start. Thanks to her team of vets, Robert and Earl, and the miracle of modern medicine, she can still jump onto the couch, or the golf-cart seat. And while she is a 'tetch' wobbly behind, she still enjoys long slow walks, and car rides. 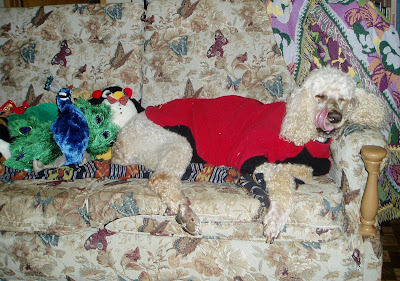 So what do you do to celebrate if you're an elderly poodle? Well, you admire the fabulous portrait painted of you by artist Lorraine Thayer. You lounge on the couch, savouring the last crumbs of your blueberry muffin "cake". And you dream about all the good folks who come to Bondi, and all the hugs, like this one from Grace last summer. We don't get a lot of kids trick or treating out here. There is an organized party at the Dwight Community Centre the night before, and on the Day itself, Huntsville Heritage Place hosts the Great Pumpkin Trail -- with the entire village awash with spooks, ghosts and treats. It's a safe, fun place to take the kids, without traffic, and well contained. The sponsors do a terrific job of providing treats -- and tricks -- for the ghosts and goblins that come to call. Still, we do our bit. And we enjoy the trick or treaters that do come around. The office was taken over by a giant spider, and there was a witch (with a wardrobe) and her trusty Ladybug standing guard outside. Inside... well... there were visits by treat-hungry princesses, a crocodile, some pirates... and then Darth Vader and his storm troopers arrived, and that was the end of the candy!